They have never arrived at the destination their forefathers set off to. Detained, they had to survive tyrannies of King Zog and Enver Hodža, to register under someone else’s name and as other nationality, but they did not forget who they were and where they came from. Neither did they forget to say that in the language of their ancestors. Their religion is Islam, but they are committed to consider themselves as Serbs, and Serbia as their homeland. Nowadays, they are taking legal actions and returning their original Serbian names. 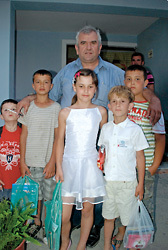 They organize school by themselves and teach their children their original mother tongue – Serbian. Will today’s Serbia be able to help them? Skadar is a huge forgotten secret of Serbian people. Our continuous existence asleep in a cradle of oblivion has deep roots. King Vojislav’s sword is still unsheathed at Saint Jovan Vladimir’s oak, saysto himself poet Budimir Dubak, the author of ”Skadar Elegy”, while an Albanian police officer is scanning us suspectedly onBožaj boarder crossing, asking for the authorization for operating the car from Dragan Davidović, General Manager of RTV of Republic of Srpska. Restrained attitude of Albanian border guards towards Serbian citizens has melted in recent years thanks to new European regulations, but distrust, out of which some old memories overflow every now and then in a lee of some larger storm, will remain a mental border even when interstate ramps are removed. Until recently, at this insection between a hill on side and Lake Skadar on the other, this winding trodden path served not only as a passage between two countries. The fading traces testify that state boundaries separated not only two nations but epochs and centuries as well. Escaping into self-isolation and advocating egalitarianism and social equality, the uniformed system of Enver Hodža managed to equalize the majority of citizens in the absence of everything that belongs to man. Starting from basic human rights and freedoms, to the most elementary means of existence. This dreadful ”equality” in ideologically single-minded Albania, without varieties, without rights to national authenticity, religion, language, culture, customs, was most painful for Serbs. And not only for the living ones, Albanized and spiritually imprisoned. Here in the country of black eagles, bunkers, barbed wire, goat cheese and cognac, there is no peace even for the dead. ”Last Ottoman Bey”, as contemporaries used to call Zog, sanguinary paid back the debt to people who embraced him twice when he sake asylum. Even more than that. Strongly supported by Aleksandar Karađorđević, Serbian weapons and officers, with volunteers and Russian mercenaries trained in barracks of Yugoslav Royal Army, under the command of Colonel Andrej Mikloševski, Ahmet Bey Muhtar Zogoli marched into Tirana in 1924 andthusbecame the President of the Republic, so as to proclaimhimself the King of Albania four years later supported by new alliances – Italians. Witnesses and good deeds are the first to perish in the Balkans. Anguish comes solely from those to whom you did well, paraphrasing the words of Ivo Andrić says our companion Svetozar Ćiraković, professor of Serbian language from Nikšić, a teacher of Serbian in Skadar at present. Seven years ago, together with fifteen colleagues, he stood up in defense of his language. We tried to oppose the same party violence which liquidated one and produced other nation by a decree in 1945. The same happened to the language. We lost our jobs, but we did not loose our soul and honor, says the respectable professor from Nikšić without hesitation, honorary educator in Albania at present, whose wage of 400 EUR is barely enough for covering travel costs from Nikšić to Skadar. Yet, like all honorable men, Ćiraković carries out his mission with dignity. Several hundreds of meters from the border we come across the bunkers – the symbols of Envera Hodža’s rule. The last European Bolshevik seeded over 700,000 of these concrete endowments during his half-century rule. They are made of concrete and iron of the best quality, and each costs as a small one-bedroom apartment on average. 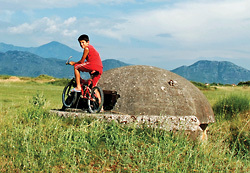 If apartments had been built instead of bunkers, everyone in Albania would have had their housing problems solved, evaluated once Jozif Zegali, called Colonel Bunker, the architect of Hodža’s defense shield. Building of bunkers was taking 70-100 lives a year. 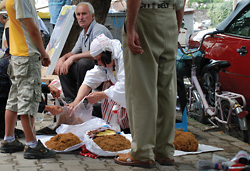 It is busy as a beehive in Skadar, street market like in any eastern market. Paper boxes, stands of wooden crates, pushcarts on street walks... Everything is at offer, from famous Skadar tiny sliced tobacco, smoked lake carp, goat cheese, various seedlings, agricultural tools, to Chinese clothes and small poultry. Traders, leaned in front of the shops, pose for cameras with two fingers raised high. Watching those relaxed people with oriental leisure, who communicate also in Serbian, it is not difficult to notice that, above all, they are physiognomically quite different from their compatriots from Kosovo. One of our hosts uses the same disparity to support his assumptions that the majority of habitants of Skadar and surroundings are of Serbian of Slavic ancestry. Twenty years after ”constitution of democracy”, approximately thirty thousand of Albanized Serbs and Montenegrins are trying hard to achieve some of the basic human rights, the right to personal and national integrity above all. 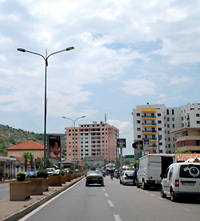 The majority of them has Albanian names in official documents, and are registered as Albanians in the Registry of Births. Changing of personal data must pass the juridical procedure first, which is a slow and painstaking process. Albanian authorities still prohibit changing of ethnicity. Serbs and Montenegrins in Albania are the people under huge impact of assimilation. The issue of Serbian minority is one of taboo topics for Albanian authorities even today. Since, never during the course of history, has existed a registration where minorities could freely state their ethnicity, there are no precise statistical data and it is very difficult to determine the precise number of our compatriots. Our Association estimates that there are approximately 30 thousands of us. The majority of Serbs live in Skadar and surroundings, but smaller communities of our brothers live in Tirana, Lješ, Drač, and in Fir where another school of Serbian has been open recently. We are an autochthon people in Albania. 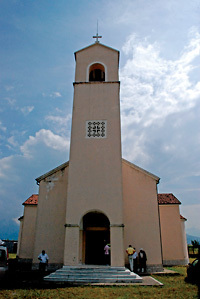 There used to be around 300 churches and monasteries scattered from Skadar to Drač . What remained are some steeples, parts of altars, ports. Around ten kilometers from Skadar, the ruins of Church of Saint Jelena Nemanjić (Anjou) still serves as an evidence of our power and dignity. Not only have medieval rulers/donors left bright traces in cultural-historical heritage of Albania, in recent history, members of our minority gave enormous contribution to the fight against fascism. Among three of the most prominent antifascist heroes, two of them were Serbs: Branko Kadić and Jordan Misje. Vasil Šantić was killed in Vraka fighting German occupiers, and Vojo Kušić was the commander of Albanian guerilla units. In post-war Albania, our compatriots established themselves as leaders in all aspects of cultural, economics and public life. Similar to the majority of countries in transition, drastic discrepancies are obvious everywhere in Albania. Among new, fine and modernly designed facilities in glass and marble, entire quarts of unhygienic shacks exist, with dusty streets and messy landfills which testify of non-hygienic habits of inhabitants who are taking big steps towards the new age. While we are climbing onto a medieval fortress of Mrnjaćević dynasty from which there is an admirable view of the rivers Drim and Bojana, Lake Skadar, Tarboš hill, fertile plain where Skadar nested, we are catching up with a group of young single Albanian women who came to pay the tribute to the patron of the fortress – young bride Rozafa. And Rozafa used to be the bride of Gojković family who was, according to the poem ”Building of Skadar”, walled in the fortress in order to sustain the foundations and to build the fortress. Skadar is a part of forgotten Serbian history. Here dwelt Serbia before Nemanjić dynasty. It is not a coincidence that King Nikola was burning with desire to liberate the old Serbian capital,says with undisguised sadness in his voice archpriest Radomir Nikčević, parson in Skadar at present. During last several years, the town got new, modern appearance: wide boulevards, fine modernly equipped buildings, built in accordance with all current standards. Symbols of communism are disappearing slowly and systematically, but everywhere there are Tači’s petrol stations – symbols of power of the leader of Drač clan and the Prime Minister of self-proclaimed Albanian state on the territory of Serbia. The monument of five national heroes form World War II was removed from the centre of the town. 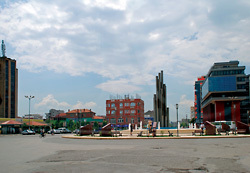 At one of the squares, there is a dominant monument of Isa Boljetinac, the leader of Kosovo kachaks whose monstrosities are still remembered throughout Kosovo and Metohija. 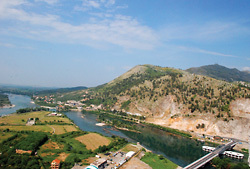 While we are traveling along the fertile plain towards Fir, someone admits that he has pictured Albania as rough, futile and inaccessible country. Along the entire road towards Tirana and Drač, we are coming across trucks overloaded with construction material, huge warehouses, new modern buildings. The majority of newly built houses are flying Albanian and American flags. Albanians were always on the side of the bigger and stronger. They were sleeping for centuries embraced by the Ottomans, they were kissing Russians, hugged the Chinese, and now they are under American umbrella, noticed professor Ćiraković. 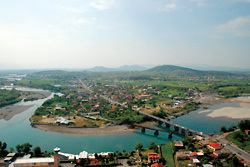 Drač is the main Albanian economic and tourist center today, built in accordance with all international standards. There are hundreds of magnificent highly categorized hotels along the sandy coast. Twenty kilometers away from Drač, near Fir, in the place called Lipovše, there is a large community of Serbs of Muslim religion. The reason for our visit is a school of Serbian in Ekerem Dulević’s house. At the entrance of the yard, there are Serbian and Albanian flags. A red canvas is stretched between them with the following inscription: KURSI E GJUNES SERBE. It is written below: Course of Serbian. Seventy-five years old Ismet Dulević, head of the family, is greeting us. We greet the hosts and their neighbors in the kindest manner. Dulević family is from Bujić near Novi Pazar. They arrived at Albania in 1924. They had been on the way to Turkey when Mehmet Zogu closed the borders. And thus Sulejman Dulević stayed in Albania with five sons and relatives, where they were Albanized to Dul. At present, there are approximately 2,500 Serbs of Muslim religion in the surroundings of Fir who are mainly engaged in agriculture. We managed to return our surnames in court, but we cannot become the citizens of Serbia. We filed the application for citizenship three years ago, bu t we have not got a reply. I am a Serb and Serbia is my homeland. It hurts me to hear that Shiptars from Kosovo obtain citizenship, and we are not entitled to it, says Ismet in a slightly designated manner, whose family counts 26 members. Forty years old Ekerem, Ismet’s son, turned children’s room into a classroom. This is our behest: not to forget Serbian language and to preserve our tradition. Until school, I could not speak Albanian, only Serbian. Only in school have I learnt Albanian, begins his confession Ekerem, a kindhearted navvy. Neither can my children be depraved of their mother tongue and of basic knowledge about themselves. Our goal is to, out of the present course of Serbia, make an elementary school with Republic of Serbia curriculum. Education of our children in Serbian is the only way for us to preserve our national entity. Even with the perimt from Albanian authorities, the school or course in Serbian language did not obtain the approval of the majority Albanian community. Ekrem and his family received serious threats form Albanians from Kosovo and Metohija several times, and there were also ”persuasions” by Bosnian community . During Ramazan, I was visited by Ismail Dizdari, President of Association of Bosnians and a member of Bosnian parliament whose name I cannot recall. They requested from me to terminate the cooperation with the Association ”Morača–Rozafa” and to join the Bosnians. I told him, in a slightly loud voice, that such association is not possible in this world. Since we were communicating in Albanian, the Bosnian parliament member asked him in Serbian why I was protesting. ”Everything is going to be all right, these are our people”, Ismail responded. Then I told him in Serbian: ”Stop telling lies, we are from Bulić near Novi Pazar and we have nothing to do with Bosnia. ” Shiptars from Kosovo threatened us as well. We informed our embassy of everything and did not loose our faith. We respect the country we live in, but we want to preserve our national identity and connection with our homeland. We are convinced that the promises regarding the building of school will be realized soon. Our children from various areas come here to learn Serbian at weekends. 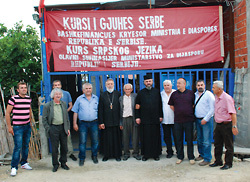 I provide transport to them at my own expense, says Ekerem Dulević, who is willing to donate the land and all civil works necessary for building of the school. According to the design, the costs of construction materials is approximately 120,000 USD. Everything else will be covered by local volunteers and their love for their roots. About twenty children greet us with a song to a small room. The scene is moving to tears. Series of ”National Review”, books and films on Serbian sanctities (gift from RTV of Republic of Srpska), electronic abc-books (gift from the Ministry of Diaspora), series of Svetigora editions, all greeted with great joy. The majority of the children dream about developing their knowledge at some faculty in Belgrade or somewhere else in Serbia one day. We leave Lipovše very late at night. Ekrem and his brothers are taking us to Ardenica Monastery where Saint Sava dwells on a medieval fresco. A giddy monk, former monk from Athos, opens the doors looking at uninvited guests with suspicion. We leave with mixed thoughts and shaken soul, once again confronted with nonsense of generally accepted criteria on democracy and human rights, aware that the stronger are more entitled to justice and truth and that we still live in a world where violence counts, and the truth has thousands of masters, as perceived by our brother Zoran Bogavac in the introduction to his ”Silent bells”. In upland Mizreka above Fir, there is a medieval monastery Ardenica, dedicated to the Nativity of the Virgin Mary. It is supposed to have been founded near the end of 13th century and at the beginning of 14th century, during the reign of despots of Epirus. It was destroyed at the end of 17th century, and the present church was built in 1743. 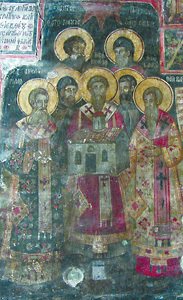 There are seven Balkan saints on one of the frescoes, among which is Saint Sava who is represented as a founder with a church in his hands. This indicates that the monastery is probably the endowment of Nemanjić family. Owing to the belief that Albanian national hero Đorđe Kastriotić Skenderbeg was married in it in 1451, the monastery was spared from Bolshevik destruction of places of worship. Namely, bishop Irineos, one of the few monks left after World War II, managed in 1967 to persuade raging communistic youth that Skenderbeg’s wedding increased the significance of the edifice and that its demolition would cause an enormous cultural-historical damage. Skenderbeg’s wedding in Ardenica actually confirms his Serbian and Orthodox origin. Three years later (1430), after a fierce resistance, Ottomans overtook that part of Albania, too, Ivan Kastriot was killed, and his youngest son Đurađ was imprisoned and converted to Islam, having got the name Skender. Owing to his courage, military and diplomatic skills, he progressed rapidly and received the title of Bey. During Ottoman-Hungarian War, Bey Skender turned his back to Sultan, liberated the place of his birth, Kroja, and regained the property of his family, gathering around himself other tribal leaders. He managed to maintain the autonomy of a huge part of Albania for 25 years. 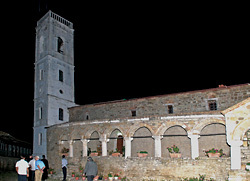 His nephew, Ivan Crnojević, founded Cetinje monastery in 1484, where Cetinje bishops have been dwelling for years. After the fall of Smederevo in 1459, the last Serbian medieval ruler Stefan Branković found asylum at Skenderbeg’s. In 1461, Skenderbeg married him to his sister-in-law Angelina who is today celebrated as a Holy Mother Angelina by Serbian church. 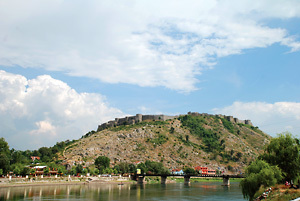 Having put superhuman efforts, Đorđe Kastriotić Skenderbeg managed to fight off several powerful attacks on his small oasis of freedom, including the one from 1466, when attack on Skadar was lead by sultan Mehmet II in person, supported by Venetians and Hungarians. After the death of Đorđe Skenderbeg in 1468, freedom for local tribes was gone. The Encyclopedia Britannica clearly states that Đurađ Kastriotić or Skenderbeg is of Serbian ethnic origin. 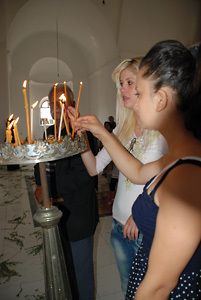 The biggest step forward regarding the perseverance of identity of Serbs in Albania is the initiation of school (course) of Serbian for children and adults which took place three years ago with the support of Metropolitanate of Montenegro and the Littoral and the Ministry of Diaspora of Republic of Serbia. We spoke to the Minister of Education Žarko Obradović and State Secretary Radivoje Mitrović. We came upon an understanding and an excellent reception. Minister Obradović informed us that the interstate agreement on the matter has been defined by Serbian party and that it is kept at the Ministry of Foreign Affairs, and that the Ministry will do everything it can so that the universities in Serbia would be able to provide additional places for Serbian students from Albania, says Pavle Brajović. In virtually every family in old Montenegro a traumatic cult of Taraboš and Bardanjolt is still alive, hills and mountain ridges where bloody battles for liberation of Skadar took place, for the old Serbian capital, in November 1912 and February 1913. The entire families remained in the eastern trench. Wire on Taraboš became a tomb for thousands of young men. At dawn on 8th February 1913, Čevski-Bjelički battalion was introduced in the charge line. Katun province habitants carried with them to slavery a torch of freedom which has never been extinguished. Honor, faith and freedom were always the most important in life, and they lived for the judgment day, for gusle and for posterity. Experienced soldiers from many battlefields, whose most powerful weapon was a brave heart, who had learnt to fight hand to hand, to look at yathagan or saber face to face with the enemy, now had entrenched and buried, almost invisible enemies. Seventeen years old Andrija Šajov, tall, strong, tucked out of muscles, was sneaking up the Ottoman positions like a panther. He was approaching, almost silently, the wire on which dozens of homes were extinguished the previous day. The eyes of his fellow fighters glimmered from the semidarkness, the majority were his cousins, ready to jump into first trenches. The secret of that fearless army was the fact that all the units were composed of the closest relatives. And a bother would never abandon a brother. Hundred meters lower, in the same formation, father Šajo (Blažo), almost breathless, was overlooking a crawling black silhouette. The entire squad, grouped in shooters, was waiting tightened to the ground. As soon as he touched the hot wire, deafening detonations broke out and disturbed the morning silence. Barely straightened figure of a fearless young man slid slowly in front of a barbed tomb. The father screamed and went forward. As if the bullets did not want him until he managed to reach Andrija whose half-closed eyes were smothering in the grays of a Skadar morning. For a moment there was silence. The father managed to embrace his son, and the sky erupted in a sharp sound of a machine gun. And while all generations, father and son, were slowly sinking into the epic reign of eternal accomplishment, in the next charge, on the same wire, Šajo’s brothers Filip and Ćetko passed to the reign of noble sentiment. The youngest Živko, heavily wounded, managed to survive. 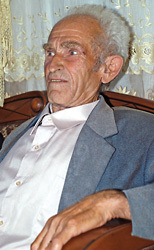 The story of six Vujović men, out of whom only one came back alive, is one of many Skadar legends which slowly disappear from the memory of oblivious posterity. At dusk of the same day, a hundred of third-class reservists asked to be admitted to the Command of costal squad. We do not want the youth to die anymore. We guard the trenches and our children are being killed. At dawn, we will fight the Ottoman trenches, and it will be the will of God. The sun has just risen behind Prokletije Mountains, and hundreds of grey heads flew up into glory and freedom from the rocky wilderness of Taraboš. Almost everyone remained to preserve one of the legends which they used to listen with gusle from their grandfathers, the legend on building of Skadar, on brotherly betrayal, on Gojko’s young golden apple which fell into the Bojana River.